This Gonzo Sword, hand-cast in bronze in 2014, is one of only 100 copies of an art object created in homage to “Gonzo” journalist Hunter S. Thompson. Offered by Quill & Brush of Dickerson, Maryland, the kooky two-foot long, ten-pound artifact depicts, according to the booksellers, “Thompson’s dual-thumbed, peyote-in-the-palm ‘Gonzo fist,’ first seen on the campaign poster created by Tom Benton when Thompson ran on the ‘Freak Power’ platform for Sheriff of Pitkin County, Colorado, in 1970.” It is one of many incredibly cool items for sale at Boston International Antiquarian Book Fair this weekend (booth 206). Check out some more highlights here. See you there! Image via Quill & Brush. 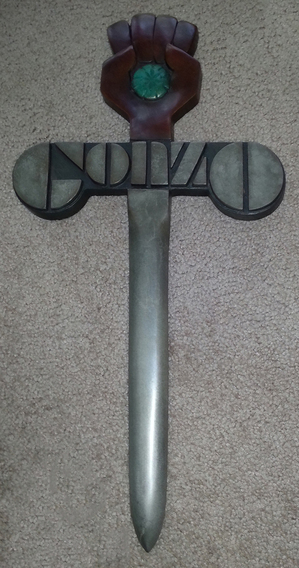 This Gonzo Sword, hand-cast in bronze in 2014, is one of only 100 copies of an art object created in homage to "Gonzo" journalist Hunter S. Thompson. Offered by Quill & Brush of Dickerson, Maryland, the kooky two-foot long, ten-pound artifact depicts, according to the booksellers, "Thompson's dual-thumbed, peyote-in-the-palm 'Gonzo fist,' first seen on the campaign poster created by Tom Benton when Thompson ran on the 'Freak Power' platform for Sheriff of Pitkin County, Colorado, in 1970." It is one of many incredibly cool items for sale at Boston International Antiquarian Book Fair this weekend (booth 206). Check out some more highlights here. See you there!